As we all know by now ABC TV has picked up a pilot created and executive produced by Dan Savage. And while the show itself remains untitled, but we do have a few details. On the comedy side, the untitled Savage comedy is a single-camera semi-autobiographical entry based on the LGBT activist/boundary-pushing columnist’s life. It centers on a picture-perfect family that is turned upside down when the youngest son comes out of the closet. What seems like the end of their idyllic life turns out to be the beginning of a bright new chapter when everyone stops pretending to be perfect and actually starts being real. Savage is responsible for organizing the It Gets Better photo campaign following the passage of Prop. 8 and numerous other anti-gay legislation. 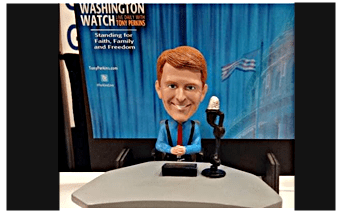 Well the Family Research Council’s Grand Dragon, I mean “President” Tony Per-KKK-ins is SHOCKED at the fact that a “vulgar” and “athiest homosexual” like our Danny boy will be allowed on television to push the dreaded “homosexual agenda. Perhaps Tony is a bit jealous. But I hear American Horror Story is looking into adding plotline on his life in Season 5. Kirk Cameron is slated to play Perkins.